My research on Israel's 'radical right' is concerned with developing a historically-informed account of the political and cultural outcomes of its earliest champions. I'm particularly interested in tracing the 20th Century evolution of the radical right, from their ideological origins through the opportunity presented to them in 1967 of securing control over Eretz Yisrael, and the subsequent development of the 'settlement' movement. This research informs my current book project: Violent Legacies: Why Militant Movements Endure which offers a comparative analysis of the 'radical right' in Israel and militant Islamism in Yemen and explores how and why violence has persisted across the generations. I've presented my research on this current in a number of settings including speaking at Edinburgh University's Department of Islamic and Middle Eastern Studies. The following abstract for the talk gives a little more insight into my research. Israel’s ‘radical right’ has a long history. From the ideological platform crystallised by Ze’ev Jabotinsky and the militancy of the Irgun, to the contemporary ‘Hilltop Youth’, efforts by this milieu to influence the political, social and religious direction of Israel have taken varying forms. Understanding the genealogy of this climate of opinion is important, not only to appreciate the origins of some of the policies we see in contemporary Israeli politics, but also to interpret how particular, often violent practices influence social relations in the regi﻿on. In tracing the evolution of the ‘radical right’ since 1967, I look at the impact of a specific element of this dynamic and diverse political stream; that led by Rabbi Meir Kahane and his Kach party. From its origins in 1960s New York, to election to the Knesset, and through Kach’s offshoots and successors, I explore how the ideas and practices associated with this fringe element of Israel’s right wing continue to resonate in Israel and the occupied Palestinian territories today. Using the frame of contentious politics, I look at Kach’s relational impact, that is, how they have informed relations between identity groups. Through this, I examine how their claim making has come to represent a specific set of subject positions, justifying and supporting a range of violent and discriminatory practices in Israel and the occupied territories. Tracing the genealogy of these actors sheds light, not only on how particular practices and ideas diffuse across time and place, but also helps to interpret how apparently new forms of political violence, notably ‘price tag’ attacks instantiated by the latest generation of far-right settlers, have evolved. 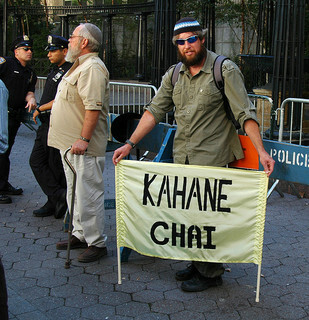 In doing so, this paper asks how and in what ways Kahane Chai (Kahane Lives)?